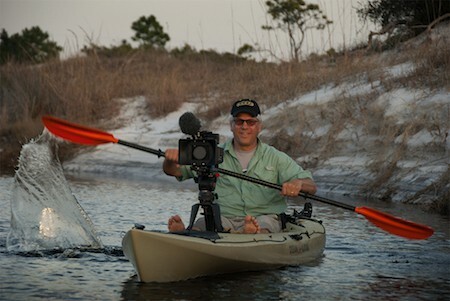 Florida State University School of Communication alumnus Elam Stoltzfus knew he wanted to be an artist in the first grade, but it wasn’t until much later in life that he found a way to meld his two passions – the outdoors and cinematography – to create masterpieces in the form of nature documentaries. Stoltzfus has spent the last three decades documenting the diverse aspects of Florida’s natural resources in order to educate and entertain through on-screen storytelling. Stoltzfus’ latest work – Florida Wildlife Corridor: Everglades to Okeefenokee – evidences his talents. He joined a team of explorers on a Florida Wildlife Corridor Expedition, trekking 1,000 miles in 100 days in 2012 to raise awareness and generate support for the Florida Wildlife Corridor project. The project is a collaborative vision to connect remaining natural lands, waters, working farms, forests and ranches from the Everglades to Georgia, protecting a functional ecological corridor for the health of people, wildlife and watersheds. “It took an amazing team to put that together, and have the vision and focus to be able to do that,” Stoltzfus said. There were many people who had input in the story. During the journey, the team interviewed 90 subjects and shot 80 hours of film footage, but then spent countless hours editing to create the final product. Stoltzfus and his team at the Live Oak Production Group not only got the project done, but were also recognized for their outstanding efforts as they were awarded an Emmy in the Documentary category at the Suncoast Emmy Awards on Nov. 23, 2013. The Suncoast Chapter of the National Academy of Television Arts and Sciences celebrates the best of television news in markets throughout the state of Florida, as well as markets in Louisiana, Alabama, Georgia and Puerto Rico. The film was also released on public television in June and has been featured at festivals such as the Sarasota Film Festival and the Apalachicola Riverfront Film Festival. Stoltzfus, who graduated from Florida State in 1988, is a proud alumnus of the university. Stoltzfus will return to Florida State on March 30 at 4 p.m., for a free screening of the Emmy-award winning documentary, panel discussion and reception hosted by the College of Communication & Information’s Student Leadership Council at the FSU Askew Student Life Cinema (942 Learning Way, Tallahassee, FL 32306). RVSP to reserve your seat. The event will focus on conservation, ecology, the history of the Florida Wildlife Corridor, video techniques and story telling through media. Stoltzfus will also discuss his current project about coastal dune lakes, which are rare geological features that only occur in the Florida Panhandle, Madagascar, Australia, New Zealand and the northern Pacific coast of the United States. Posted in News & Events. Tagged as College of Communication & Information’s Student Leadership Council, Elam Stoltzfus, florida corridor project expedition, Florida State University, Live Oak Production Group, School of Communication, suncoast emmy awards.